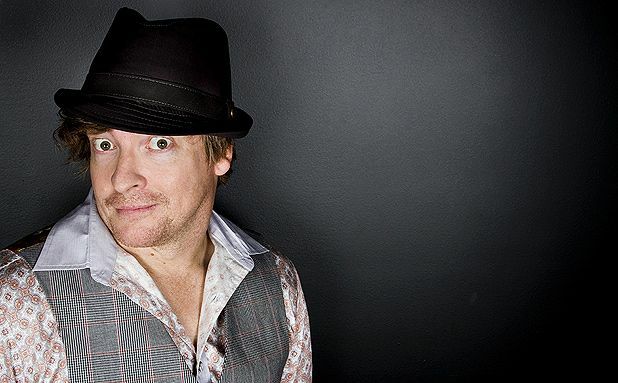 The real Rhys Darby could be many different things, depending on who you ask. To legions of fans of cult HBO comedy series, Flight of the Conchords, Darby plays the haplessly deadpan Murray Hewitt, manager to Bret and Jemaine’s criminally under-successful indie-folk duo. Murray is the one diligently booking them gigs at the local library, taking roll call at band meetings, and bravely ignoring cries of ‘ginger balls’ from passers-by. According to certain online fan forums, Murray’s the star of that show. Moviegoers meanwhile, might recognise Darby as the DJ in Richard Curtis’ The Boat that Rocked, or Jim Carrey’s painfully uncool boss in Yes Man, another well-meaning try-hard, this time with a Harry Potter obsession. The latter was a small role, and despite sharing the screen with Carrey and kooky-cute Zooey Deschanel, it was enough to make US film reviewers single him out as the real scene-stealer. Then there is Darby’s stand-up career, which began ten years ago. He was an Edinburgh Festival virgin back in 2001, a year before the Conchords arrived in town where they landed themselves a Perrier nomination. His DVD Rhys Darby Live: Imagine That! is a platinum seller in New Zealand, and having just finished sell-out tours in London and Australia, he’s readying himself for a triumphant Fringe return. ‘It’s going to be really cool bringing a show I know people will actually come to this time,’ laughs Darby, who spent six Festivals doing his own flyering on the Royal Mile, trying to drag bums onto seats. This time around, the Udderbelly is flying him over, most probably to a hero’s welcome. For his one-man show, It’s Rhys Darby Night, he’s bringing three new characters, plus his stand-up; a surreal blend of physical comedy, beatboxing and frighteningly good sound effects. Kind of like Eddie Izzard with a Kiwi accent or Peter Sellers meeting Michael Winslow from Police Academy. Rhys Darby, Udderbelly’s Pasture, 0844 545 8252, 6–15 Aug, 10pm, £15 (£14). Last seen on TV as Murray in HBO's' Flight of the Conchords '. In films' Yes Man' and' The Boat That Rocked '. Watch Rhys live in his new show full of characters and stand-up.